You won’t get new players if they can’t register! Image 1. 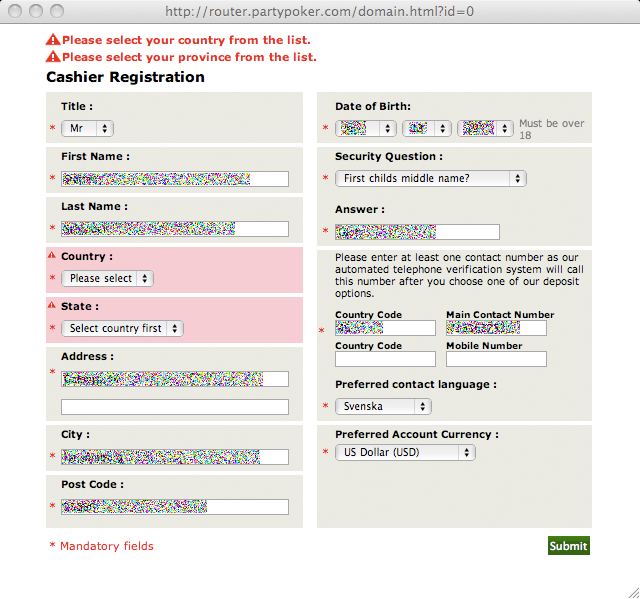 PartyPoker instant sign up form. One of the most important things for gaming operators is to make sure all the basic functionality works 100%! Today I tried to sign up at PartyPoker (this used to be linked partypoker.com but bwin.party asked me to remove the link) using their instant poker client and everything worked fine until I got to the second step (in the first step it was a real hazzle to find a username not already taken). But I couldn’t complete the second step. As you can see in the image above I got error messages saying “Please select your country from the list” and “Please select your country first”. Only problem was that the country dropdown was empty and I couldn’t select Sweden. This is really a dead end for me as a player. What should I do next? I’m not going to contact the customer support for help, not that eager to play right now. Insted I’ll just go to one of my regular poker sites and play. So for the momeny I’m one lost player for PartyPoker just because the basic functionality didn’t work. The registration process is really an important step in the conversion of interested users visiting your website to be active players, yet I see it over and over again that gaming portals have lousy sign up forms. I know that minor modifications to the registration process can increase the conversion rate a lot. The best thing is to put yourself in the players situation and figure out user flows and do some user testing. It will be worth it!